The Bankruptcy Legislation Amendment Act 1996 was a key piece of legislation, making substantial and important changes to the Bankruptcy Act 1966 (Cth). As part of these reforms, s 27 of the Bankruptcy Act was amended to vest exclusive jurisdiction in bankruptcy in the Federal Court and Federal Magistrates Court. The effect of this was to oust the State Supreme Courts’ jurisdiction in dealing with bankruptcy matters. This article proceeds on three propositions. First, the amendment intended to achieve just two narrow procedural goals. Secondly, despite these intentions, the amendment had a much broader impact on the bankruptcy landscape. Finally, this disconnect between purpose and effect has caused serious problems for State Courts and the law in general. In light of these propositions and the amendment’s 15-year anniversary having passed this December, it is time to consider legislative reform. Australia’s company laws have always imposed moratoria on court action while external administrations are on foot. Those moratoria have always been subject to a right to seek leave of the court to commence or continue proceedings. But no court has determined authoritatively whether leave must be granted on appeal if it was not sought below. This article surveys the jurisprudence relevant to that question and finds that the answer is still at large. Reasoning from first principles and a purposive approach to interpretation of the Corporations Act 2001 (Cth), it argues that leave is necessary on appeal if it was not granted at first instance, but if leave was granted at first instance, it need not be refreshed on appeal. Shakespeare uses the idea of bankruptcy in several of his plays and poems. At the time, bankrupts were regarded with much suspicion, they were vilified and labelled frauds, and bankruptcy was possible for traders only. This article considers the relationship between the early English bankruptcy Acts and current Australian law and examines how Shakespeare used the idea of bankruptcy, including the stigma attaching to bankruptcy, to both reflect, and influence, contemporary perceptions, and how his influence in relation to the idea of bankruptcy is still observable today. Through imagery and metaphor he created a persona for bankruptcy removed from its statutory housing, freeing it to inform moods, emotions, longings and sympathies. This article addresses in depth the question of whether s 420A of the Corporations Act 2001 (Cth) imposes “strict liability” upon a controller for the failure of an agent or expert to take reasonable care. The weight of existing authority appears to suggest that controllers are liable under s 420A for the carelessness of their agents or expert advisers. However, a closer analysis of the text of the provision and relevant Australian and UK case law demonstrates that this aspect of the statutory construction of s 420A remains very much an open question. This article ultimately contends for a construction of s 420A which requires a controller to adequately supervise and scrutinise, but which does not render a blameless controller strictly liable for all careless acts and omissions of agents and expert advisers. 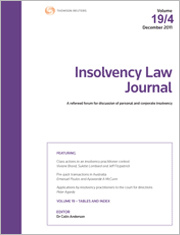 For the pdf version of the table of contents, click here: Insolv LJ Vol 20 Pt 2 Contents.